In 2017, Coram International was contracted by UNICEF to conduct a formative evaluation of UNICEF’s child protection work in Cambodia. 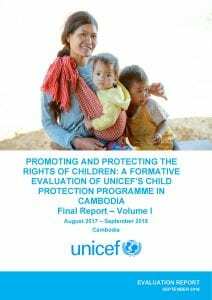 The objective of the evaluation was to provide evidence that can help strengthen performance and accountability with UNICEF’s work with the Royal Government of Cambodia and other authorities and organizations involved in child protection. The evaluation has reviewed results of the Programme, assessed UNICEF’s leadership in the sector and examined linkages between outputs. It has also informed the development of a new theory of change to measure progress and contribute to the design of Cambodia’s new Country Programme 2019-2023. The primary users of the evaluation are mainly the Government and UNICEF. This evaluation used a theory-based approach to analyse UNICEF’s Child Protection Programme’s achievements and areas for improvement against the criteria of relevance, effectiveness, efficiency and sustainability, incorporating cross-cutting issues of gender equality, equity and human rights. The evaluation employed a mixed-methodology of quantitative and qualitative data collection of rich, accurate and measurable data that has been triangulated and analysed to produce high-quality conclusions and recommendations. Quantitative data analysis was performed using case management and monitoring data as well as case file reviews and a beneficiary survey for those undergoing reintegration. Qualitative data analysis looked at a document review, key informant interviews, case study interviews with support recipients and focus group discussions with community members and parents. The evaluation’s main conclusion is that the Programme has ambitious goals and has made a good start, but there is still work to be done. Evidence shows that there remains a risk that implementation of the various action plans, the safe reintegration of 30 per cent of children from residential care institutions and child protection system-strengthening generally are likely to be impeded by ongoing political, economic and socio-cultural barriers.